If you’re anything like me, you’ve waited all year for tomato season. You gave winter tomatoes the cold shoulder in the depths of January and maybe succumbed to just one or two packages of grape tomatoes in March, immediately ruing the purchase of those red herrings that look like the real thing but taste as if they were grown on Mars. I get it. I do not eat off-season tomatoes, either. I never have. I remember picking around them in the salad bowl as a child. So when July and August roll around, I am absolutely avid to eat my way through the garden. As I write this I’m snacking on purple Cherokee cherry tomatoes. Big yellow and pink-streaked tomatoes are lined up on the kitchen counter. The vines out back sag under the weight of the harvest. I love them all, but how will I use them up? I froze a peck of the large tomatoes whole to use in chili and soups next winter. About four big tomatoes or five medium take the place of a large can of peeled plum tomatoes. The skins slip off in the kettle as the tomatoes thaw and slump, and I remove the skins with tongs. I have made a couple of salads of halved cherry tomatoes tossed with pesto. I dispatched a few tomatoes in BLTs. Tony has eaten a few sliced, salted and topped with Kewpie mayonnaise. And still they come. 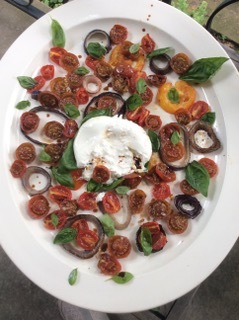 So I dreamed up a new side dish last week to showcase summer tomatoes in all their evanescent glory. It’s a kind of roasted Caprese salad of lightly baked sliced tomatoes in all sizes and colors, arranged on a platter with roasted red onion. This colorful still life is strewn with baby (or chopped) basil leaves, coarse sea salt and cracked black pepper. Two globes of burrata cheese are nestled among the tomatoes. When the cheeses are cut into, the cream flows. You may have a hard time finding burrata, a fresh mozzarella cheese shaped into a bubble with cream and bits of mozzarella inside. Although it is on every trendy restaurant’s menu, few supermarkets here carry it yet. I found it at West Point Market in Fairlawn. You could substitute balls of fresh mozzarella cheese if desired. I served this side dish on a white turkey platter, and it looked stunning. It used up a lot of tomatoes, too. Line two baking sheets with foil. Film the foil with olive oil. Cut onion into 1/4-inch slices and arrange on a sheet. Cut the cherry tomatoes in halves and arrange on sheets, cut sides up. Cut the medium tomatoes in 1/4-inch-thick slices and arrange on sheet. Drizzle everything with olive oil. Roast in a 400-degree oven for about 25 minutes, until the cut sides of the cherry tomatoes just begin to puff and the onions are soft. Cool to room temperature. While the tomatoes and onion bake, bring cheese to room temperature. When the vegetables are room temperature, arrange on a platter, separating the onion slices into rings. Season with salt and pepper and sprinkle with vinegar. Scatter basil over all. Place cheeses on the platter and cut into the globes at the table, spilling the cream over the tomatoes. Makes 4 servings. If only Caribe Bakery were easier to get to from my home in Copley. If only the 40-minute drive didn’t involve a boatload of traffic, potholed streets, several turns, getting lost (once) and a confusing exit off I-71 (the “off ramp” mentioned on MapQuest is a couple of miles long). Still, when the memory of the hot, annoying drive fades, I’ll probably try to talk Tony or a friend into giving the restaurant another go. It is simply splendid. The Cuban-Puerto Rican food at Caribe is as good as any I’ve had anywhere. The succulent roast pork is falling apart and dripping with juices. It is dished up in big chunks, with the occasional piece of rind honeycombed to a crisp. Piles of black beans and rice and fried sweet plantains are scooped into pressed-foam containers. They are just two of the many side dishes possible with dinners. Ah, but those empanadas and Cuban sandwiches. They are impeccable. The deep-fried empanadas feature a world-class crust and a spicy ground beef filling folded into mashed potatoes. The Cubanos are classic hot sandwiches of Cuban bread made on the premises and filled with sliced ham, that incredible roast pork, white cheese, dill pickles and mustard, welded together in a sandwich press. The $16 full sandwich we ordered (small and medium also are available) came in four pieces, each about 7 inches long and individually wrapped. That was four hefty sandwiches, for cripes sakes. The “bakery” is beyond down home. Customers line up at one corner of a big U-shaped counter, steam tables on two sides and bakery cases on the other. The number of choices is staggering and look drop-dead delicious lined up on the steam tables behind glass. There are reddish stews and skewers and roasts and all manner of pork, chicken and beef preparations sending out tendrils of aroma that mingle above the cases and draw the diners forward. The menu on the wall is in Spanish. Even if you’re fluent, you may have to ask an English-speaking server for help. Everything is served cafeteria-style in to-go containers that you can take next door to a spacious room of utilitarian tables and chairs. The utensils are plastic, the napkins are paper and you may have to wipe off a table before you sit down. Who cares? Caribe Bake Shop is at 2906 Fulton Rd. on the West Side of Cleveland not far from Ohio City. The phone is 216-281-8194. Hours are 7 a.m. to 7 p.m. daily. The bakery-restaurant has a bare-bones site on Facebook. MAKIN’ BACON: We’re deep into BLT season at my house, which no longer is messy since I began cooking bacon in the oven instead of in a frying pan. A brush-up may be in order. To cook bacon to a lovely, straight, almost grease-free crisp, line a couple of rimmed baking sheets with a double thickness of paper towels. Arrange raw bacon strips close together in a single layer on the sheets. A pound of bacon will cover about 1 1/2 baking sheets. Bake in a preheated, 350-degree oven until the bacon is brown and looks crisp, 30 minutes or so depending on the thickness of the bacon. Don’t worry if the bacon strips are still bendy; they will become crisper as they cool slightly. Roasted eggplant Parmesan; blackberry frozen yogurt (yuck); cantaloupe and prosciutto, and roast tomato and red onion salad with burrata cheese; grilled sockeye salmon with cucumber-dill sauce, sautéed yellow squash and cherry tomatoes with sea salt; BLTs and corn on the cob; sugar-free blackberry pie; purple Cherokee cherry tomato and pesto salad, roast pork with mojo seasonings, just-dug thin-skin baby potatoes halved and roasted with olive oil and coarse salt; pesto; roast plum confiture; high-protein chocolate ice cream. Spicy Thai salad (half) with chicken at Panera; a beef empanada, Cuban sandwich, yuca (baked?) with onions, fried sweet plantains and Cuban roast pork at Caribe Bake Shop in Cleveland; nine sweet and savory zucchini dishes, including zucchini relish and chocolate zucchini bread, as a judge at the Zucchini Smackdown at the Seville Farmers Market; sugar-free vanilla yogurt with chopped peanuts at Menchie’s. I loved reading the note from your fan in the U.K. It brought back memories of when we lived in Scotland in the military in 1973. I was surprised that their meat markets had poultry just hanging in the windows, and other meats just sitting out on the counter. The butcher had a beef hind quarter there that he would slice off whatever size piece you ordered. They also had fresh eggs sitting there without refrigeration. The temps in Scotland were never that hot, but the practices never changed for the summer months. We just made a return trip to Scotland this July and I was amused that they still leave the eggs out on the shelf without refrigeration. Why is that safe there and we are so obsessive about refrigerating our eggs in the U.S.? The reason is a strain of bacteria that arose in the early 1980s in U.S. chicken breeding flocks, but has not yet traveled abroad. Salmonella entideritis is capable of infecting eggs in the shell, transmitted directly from the mother hen. Until this new bacteria mutated, unbroken eggs were thought to be incapable of harboring bacteria. That is still the case in Europe and Japan, where I’ve seen cartons of eggs stacked on the floors of supermarkets. So it’s still safe to eat raw eggs and store them at room temperature in Europe and Japan, but chancy here.